Jean baré Gel and Milk Cleansers / Gee Whiskers! I while back I went for a Jean baré facial (read the post here) and I was so impressed with the products that I left with 2 facial cleansers. Jean baré believes in double cleansing, using a gel cleanser followed by milk cleanser. Both cleansers focus on balancing and cleansing the skin. The gel was is my favourite simply because I am a fan of foaming cleansers purely because my mind makes me think my face is cleaner. The problem with gel cleansers is that they can be dehydrating on the skin and therefore it shouldn't really be used by people with dehydrated skin, such as myself. The cleanser is a pH balanced, soapless cleanser that unblocks pores with its deep purifying foaming action. It also helps to balance out oily skin areas. The milk cleanser is enriched with distinctive active ingredients with a focus on avocado oil - you get a rich cleanser that balances out the dry areas of the skin. Furthermore the avocado oil elevates the pH levels in the skin whcih increates the moisture levels and balabces the gel wash's lower pH. It has a think rich consistency that puts lost moisture back into the skin. When it comes into contact it emulsifies and you get a really lovely feeling product on your skin - this product alone has converted me when it comes to milk cleansers. I honestly do not like milk cleansers at all but this one I can quite happily use. 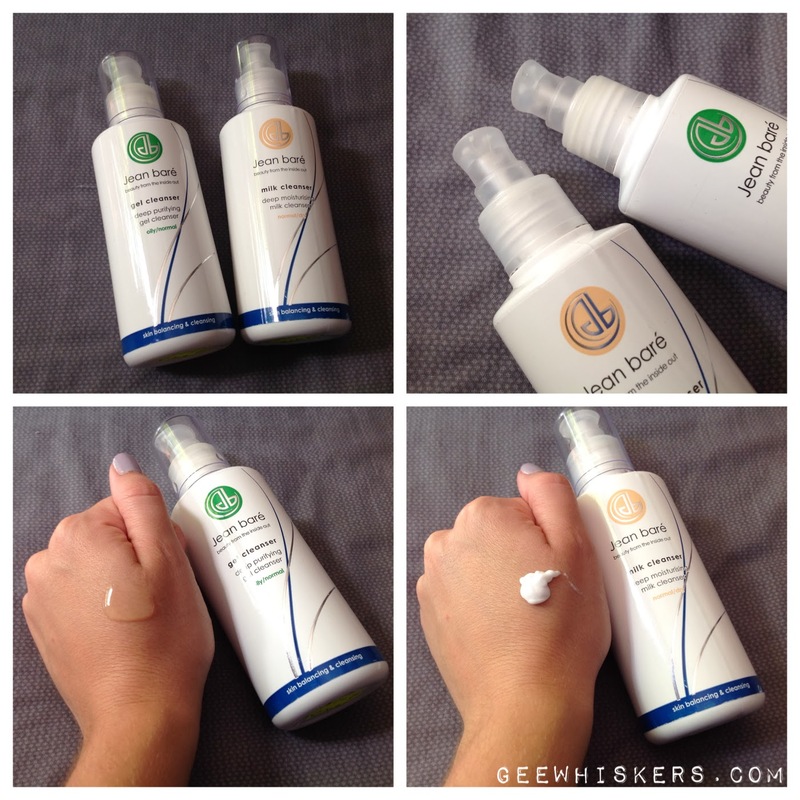 Both cleansers come in 200ml pump action bottles and cost me R184 each at the time of purchase. It might seem very pricey to some people for face washes, but I honestly have noticed a huge improvement in my skin since using these bottles. One or two pumps of each cleanser is more than enough to wash my face, neck and chest area. These bottles are going to last me a very long time so the investment was well worth it in my opinion. Let me know if you have heard of Jean baré and what you think of their products.